Hollywood has always been known as a bastion of liberalism, but after the relative success of “Obama 2016”, the anti-Obama documentary that made a surprising $32 million at the box office (making it the 4th highest-grossing documentary ever), people have begun to wonder if things will change. Maybe Hollywood will see that there is an audience for people who don’t flock to the latest Michael Moore documentary and start producing movies with explicitly conservative messages. If “Won’t Back Down” turns a profit, it will only confirm those suspicions. In many ways, it is an utterly conventional film, but it arrives in theaters surrounded by political controversy. Tackling the issue of education reform through the mostly true story of a parent and teacher who teamed up to take over a failing school, the movie has been attacked from those on the left for being anti-union, and most critics have dismissed it as too didactic to be effective as a film. It is the kind of movie that people will form an opinion about long before they actually see it. Which is kind of a shame. “Won’t Back Down” may be simplistic, blunt, cloying, and manipulative, but as an inspirational story, it is surprisingly effective. In other words, it is everything you expect from a movie named after a Tom Petty song. Maggie Gyllenhaal plays Jamie Fitzpatrick, a tough but sunny single mother, whose dyslexic daughter has recently been transferred to Pittsburgh’s worst public school. 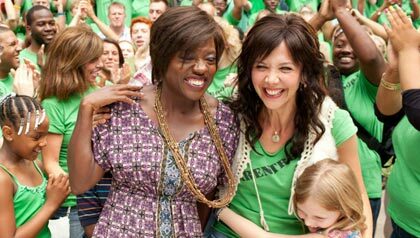 After meeting Nona Alberts (Viola Davis), a sympathetic teacher, the two set about trying to take the school over and install themselves as administrators, which is possible under a newly-enacted law. The duo encounter resistance at every turn – parents who are too willing to accept the status quo, teachers afraid of losing their job, and a hopelessly complex bureaucracy at the board of education. But Jamie and Nona never give up because…well, because it is that kind of movie. “Won’t Back Down” is familiar stuff – it follows the inspirational social issue drama handbook to the letter – but is buoyed by the performances of its two leads. Gyllenhaal and Davis are both outsanding in their own right, but the two also have terrific chemistry. Their characters have both been abandoned in different ways by the men in their lives. In working together to change their school and their community, they give each other a sense of purpose and vitality that each has been missing. We are used to seeing this kind of performance from the Oscar-nominated Davis, but I was a bit taken aback by Gyllenhaal. Gyllenhaal has a reputation as a fine, respected actress, but she is in full movie-star mode here, elevating a pedestrian script through sheer willpower. As for the message behind the movie, it’s impossible not to make a comparison to other education dramas like “Dangerous Minds” and “Stand and Deliver.” Those movies posited that our failing education system can be changed by a few innovative teachers, but “Won’t Back Down” looks deeper into the complex web of problems, that have prevented education reform, which is mired in gridlock despite being consistently rated as an issue people care deeply about. Of course, the big question is: is the movie anti-union? Yes. But it’s also anti-crappy parents, anti-disinterested teachers, and anti-bureaucracy. In its first third, “Won’t Back Down” successfully identifies a range of obstacles to fixing the education system, but a conventional narrative structure forces the filmmakers to turn one of them into the villain. For that role, they choose unions. As Jamie and Nona being to make progress in winning over the teachers and parents in the community, the Pennsylvania Association of Teachers (a fictional organization) launches a smear campaign against their efforts and against the women themselves. The filmmakers’ willingness to give voice to opinions on all sides slowly turns to propaganda in the film’s final third – when not one but two central characters who have previously been identified as pro-union disavow themselves of their tactics. But the choice to vilify unions is not just a product of the film’s conventional sense of narrative – it is also an inevitable result of our toxic and divisive political discourse. Is there room for serious debate about federal education reform and the role unions may play in perpetuating gridlock? I’d like to think so, but I can’t remember the last time I heard a reasonable discussion about it, and in the end, “Won’t Back Down” is no exception. The filmmakers try to paint themselves as unbiased, and they give pro-union talking points considerable screen time, but they ultimately cannot the escape the tendency to search for easy answers and assign blame to just one party. The film’s climax finds supporters and opponents of the new school literally sitting on opposite sides of a school board hearing – wearing shirts to identify which team they are on. That kind of divisiveness works well in a crowd-pleasing movie, but it does nothing to advance the issue. In spite of its simplistic politics, the populism at the heart of “Won’t Back Down” resonated with me. At its core, it is a film about powerless people who beat the odds and make change. It’s hard to dislike a movie like that, particularly with such strong performances at its center. I doubt, however, that it will find a wide audience, as it has already become enmeshed in our polarized political discourse. But perhaps the film offers a good litmus test. If a liberal finds nothing of value in “Won’t Back Down,” I would argue that he or she is hopelessly lost to the left. If a conservative cannot acknowledge that the movie assigns too much blame to the unions, he or she is hopelessly lost to the right. The film’s portrayal of teachers’ unions can and should be debated – but I give the filmmakers credit, not blame, for raising the issue. With an education system that is failing so many children right now, no topic should be off-limits.